¶ Pistons and Cylinders are pretty straight forward. 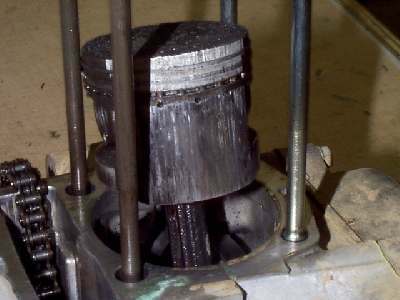 After you take the head off try to move the piston, sideways, in the bore. There should be almost no movement. look at the cylinder. 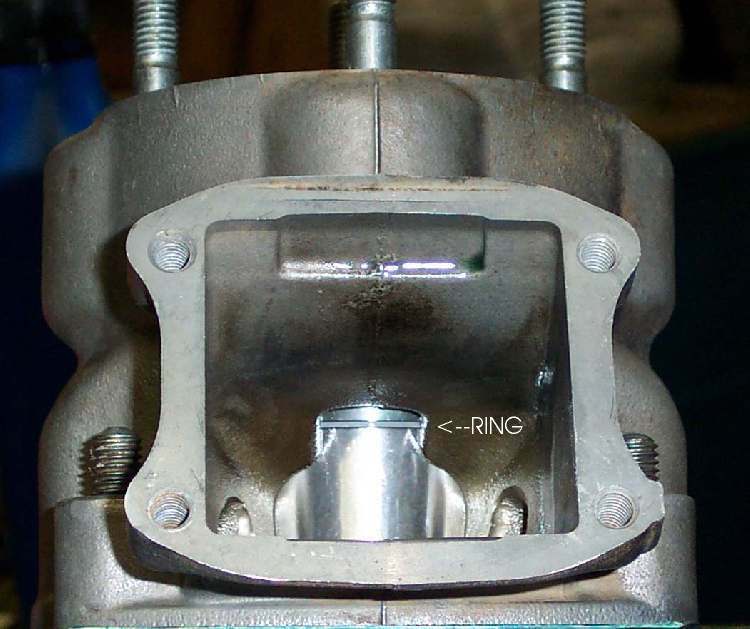 If there is an obvious ridge at the top of the cylinder and you can feel it with your finger, and there is piston movement sideways, you are going to have to bore it oversize. The factory oversizes are in quarter millimeter increments. Like .25,.50,.75,1.0 and the like. .25 mm is about .010". That's enough to clean up the bore, but it is not enough to increase the size of the engine by much. 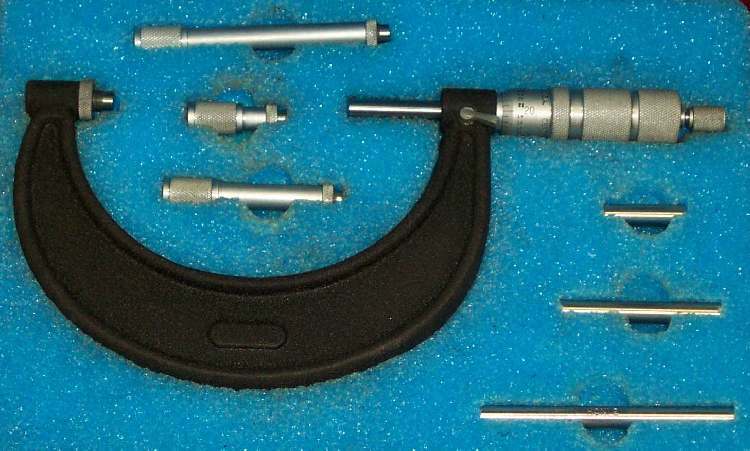 If you are unsure, measure the diameter of the bore and the diameter of the piston with inside and outside micrometers. Measure the piston about 1/2" up from the bottom of the piston skirt. Now measure the cylinder bore in several places at right angles to each other. Subtract piston diameter from the biggest bore diameter. This gives you the piston clearance. 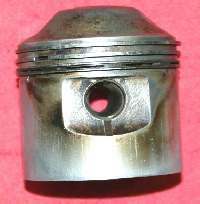 Piston clearance varies due to a number of factors. Type of metal the piston is made of. Is it a cast or forged piston. Is the engine air or water cooled. Is the engine two or four stroke. 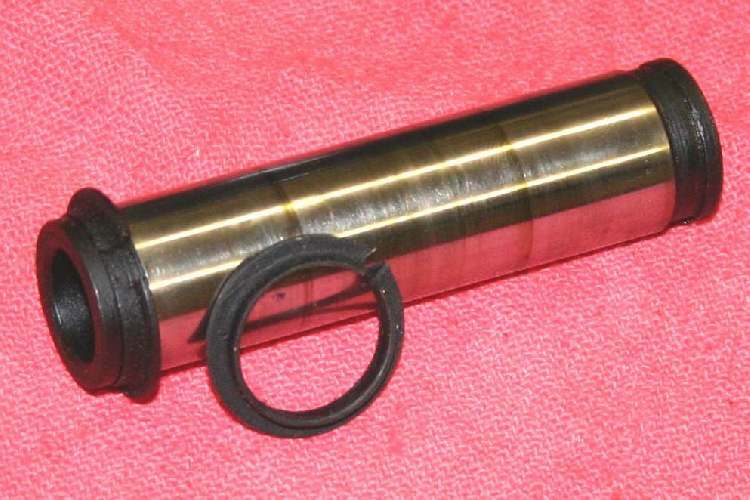 A small (50mm bore) cast piston, 4/stroke may have half a thou (.0005" or .0127mm ) piston clearance, while a big, forged piston, 2/stroke (73mm, 2.874") can need .003" (.075mm) or more. You will need a shop manual to find the clearance for your bike. Now this is the minimum. What is the maximum? I once had the exhaust off of a 400cc 2/stroke single, and I was able to slip a .020" feeler gauge between the piston and cylinder. Why did I have the pipe off? The guy wanted me to check the pipe out. I found several, large, rubber, air cleaner box mounts in the pipe! The guy said he had never had the pipe off. The bike ran for several more months before the piston skirt broke. Bottom line, get a shop manual and get the right clearance. If it is an after market piston, use the piston manufacturers clearance recommendation. If your old piston is within spec, and you want to reuse it, you will need to measure the ring side gap. Side clearance (gap) is measured with a feeler gauge, with the ring in it's groove in the piston. 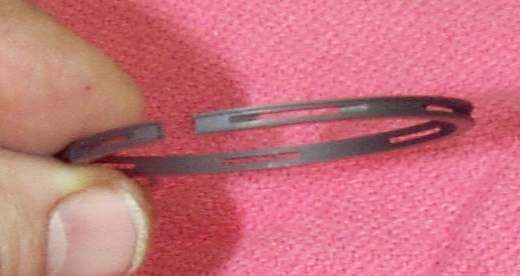 Just try to fit the feeler gauge between the ring and the top or bottom of the groove. They can be .001" to .003"(.025mm to .0762mm, check the manual). 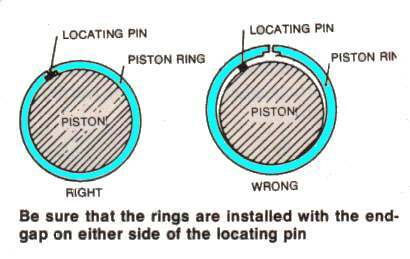 If you are using a new piston and rings you do not have to check this. If the gap is too much, even with new rings, you will need to replace the piston. Everybody seems to think a new set of rings should cure everything. I wish it was true... but it's not. I would say 95 % of the time, on a dirt bike, you will need to bore it oversize. Sometimes, on a big street bike, the pistons will be within specification, but on most of the dirt bikes you are going to have to bore it. It is best to have the cylinder bored on a boring machine. I have honed them as big as .040" over and I held it to spec on taper and out of roundness, but it took forever. Now, if I go bigger then 1/4mm or .010" I like to bore them on a machine. If you do try to hone them be sure to use a good hone like a Sunnen or Ammco. You will have to measure the piston and then bore the cyl to fit. Do not bore the cylinder unless you have the piston to measure. If you do, the clearance may be off. Remove the circlip and push the wrist pin out with a screw driver. You may lightly tap it but if the pin is in too tight, you will need to pull it with a wristpin puller. 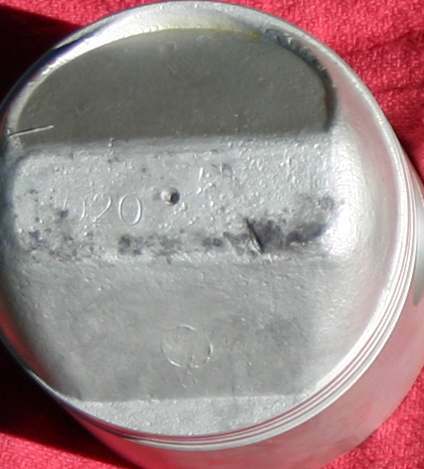 If the piston has seized and smeared aluminum on the cylinder you will need to remove it before you measure it. You can do this with Muriatic acid. Just take medicine dropper and put just a few drops on the aluminum that has been smeared in the cylinder. The acid will eat the aluminum but will not hurt the steel of the cylinder. DO NOT GET THE ACID ON YOU . If you do get it on yourself, water and baking soda will get it off. Also don't get it on any aluminum unless you want that aluminum eaten up. You can get Muriatic Acid at any home improvement store. They sell it buy the gallon, which will do about a billion cylinders. I'm not sure what they use it for... swimming pools or something. See the Acid Page. OK, you and your buddy are charging up a hill, you can't let him beat you, can you? Of course not. So you really ran that puppy HOT and melted that Piston down good and proper. Drag it home, boiled off all that smeared aluminum, bored the Cylinder, put in new Pistons, Rings and all. Run it long enough that the rings should be seated and WOW. It just will not stop smoking. Now what? You probably "Burnt" or "Scortched" the Cylinder. You got the metal in that Cylinder too hot and it took the temper out of the steel. The only real cure is a new Cylinder or Cylinder liner. Be sure and check the Cylinder head for flatness too. All that heat might have warped it. Beam me up, Scotty! 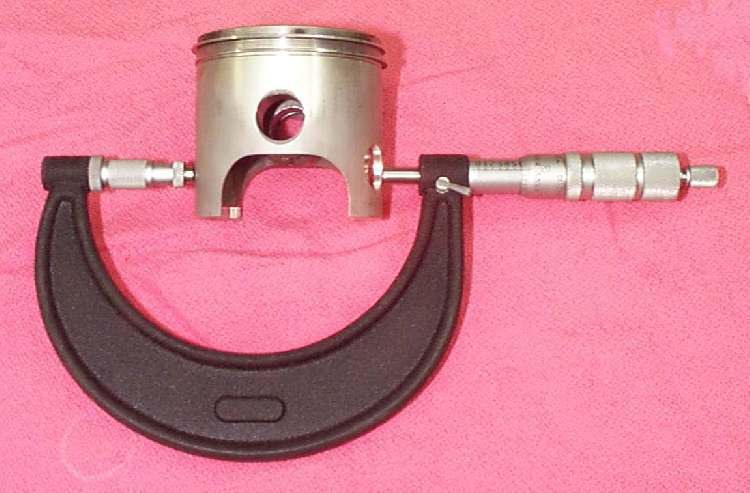 If you have a 2/stroke, be sure to look at the top of the piston. If it looks like a rat has been chewing on it watch out. It means that the bearings in the bottom end are starting to go. If you put in a new piston it will just be ruined as more bits of bearing shed by the lower crank and rod bearings. The cure? Rebuild the bottom end. Be sure to check the cylinder for any rust pits. 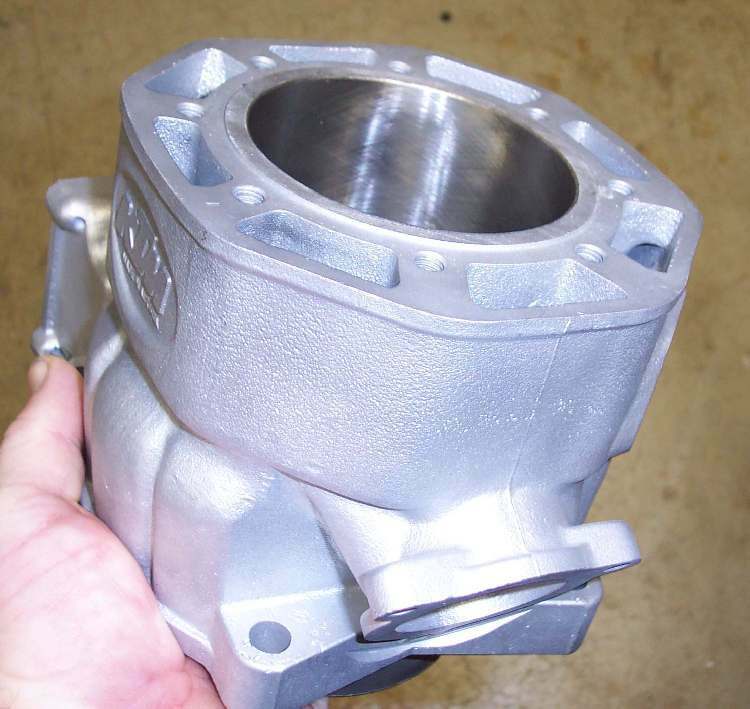 If there are any you will need to bore the cyl to a bigger over size to get rid of them. If you are restoring a machine, you will find these rust pits are wherever the rings stopped in the cylinder. A lot of water is created during combustion. Supposedly, about a gallon of water for every gallon of gas burned. Some of that water tends to collect around the rings. When you get your cylinder back always ask if they cleaned it. Most places do but, you never know. To check, take a clean rag, put some fresh oil on it and wipe the inside of the cylinder with it. If it brings up any dirt, take your cylinder and wash it in lots of hot soapy water. Immediately dry and oil the cylinder so it will not rust. 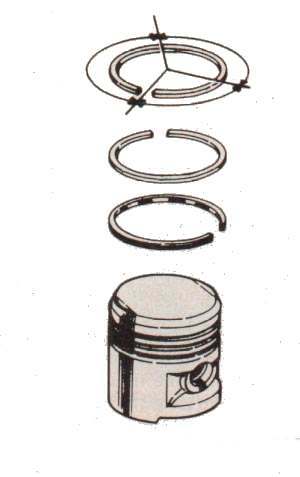 The piston's rings must have a small gap between the ends when they are installed in the cylinder. This end gap is given in the shop manual and can vary quite a lot. Like .006" to .020"(.15mm to .08mm). 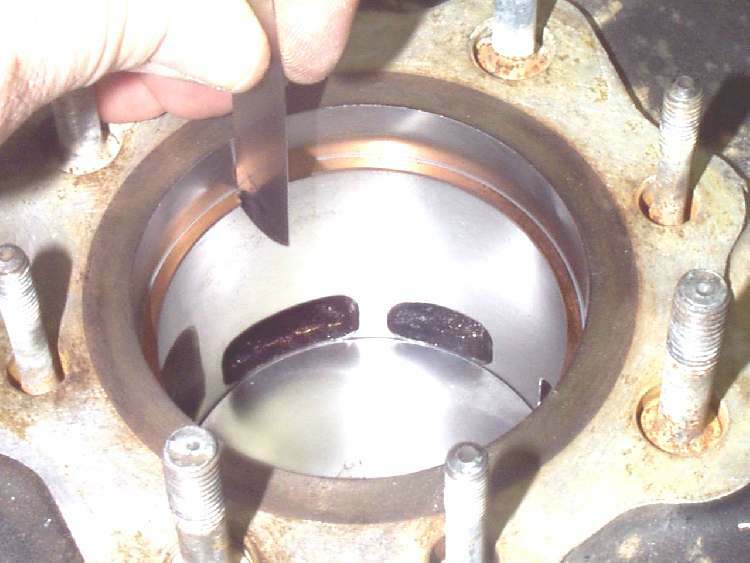 End gap is measured by putting the ring to be measured in the cylinder and pushing it up with the piston to within 1/2" of the top of the cylinder. 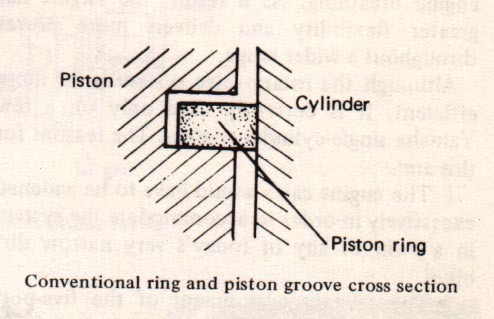 By pushing it with the piston, the ring is squared up in the cylinder bore. Now you can easily measure the end gap. If the gap is too small, file a bit on the end of the ring (Carefully!). Do only a little at a time, until you are within spec. If it is too big... well... ah... tough! When I install a new Ring use I like to use a ring expander if I can. If you don't have one you can do it with your fingers, just be careful not to spread the Ring open too far or bend it sideways too much. 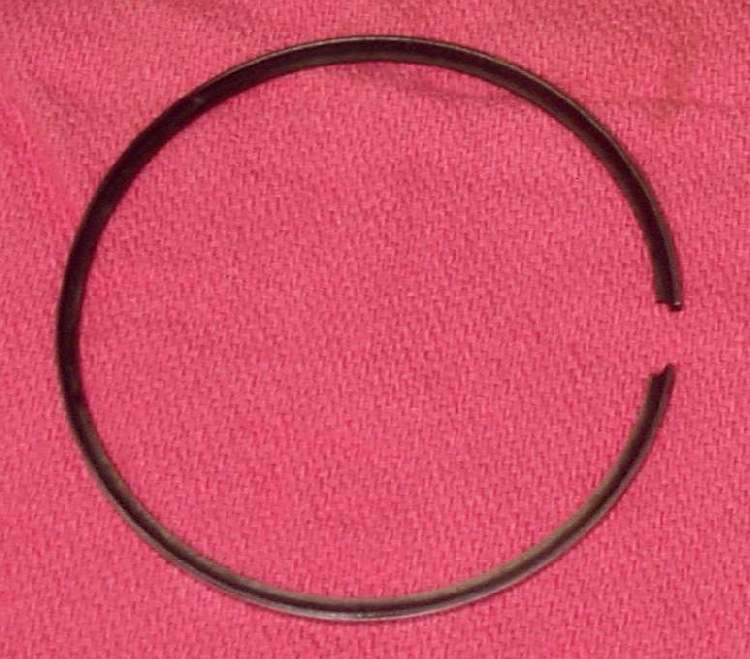 Rings are very hard and brittle and break easily. Always install Rings with the markings on the rings up. A word here on rings. 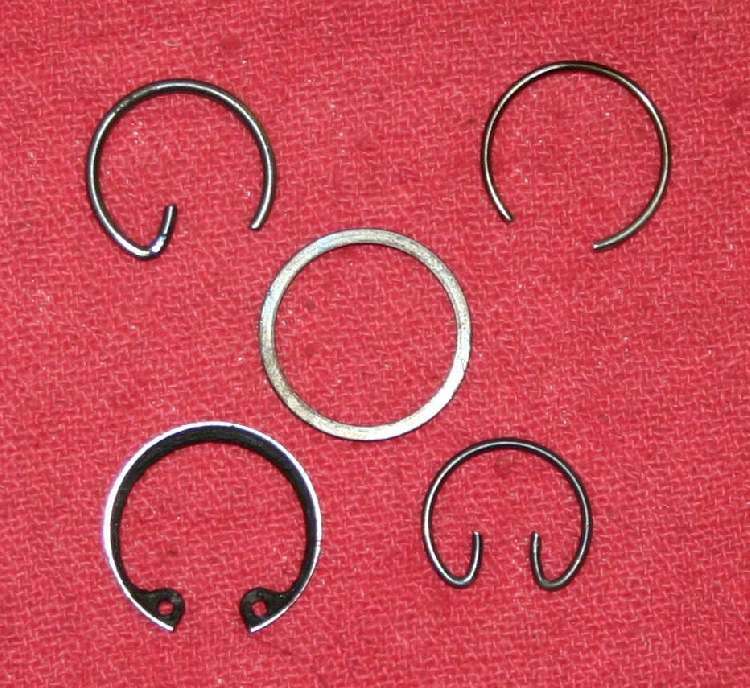 There are many different styles and types of Rings. Dykes, Keystone, Standard, you name it. You must replace any Ring with the same type and size. Some people think that the spring pressure exerted by the Ring on the cylinder walls is what seals in the combustion pressure. That is not true. Think about it. 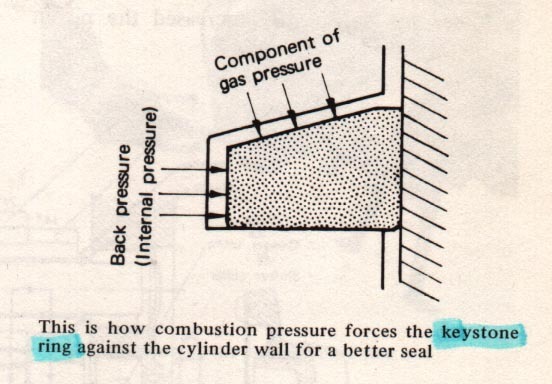 Combustion produces several thousands of pounds of pressure. You can compress the ring with one hand, right? It is that combustion pressure itself that channels down between the piston and ring, pushing the ring against the cyl wall. So don't put a .5 over ring in a .25 over cylinder and think you are helping, your not. In fact, that Ring will not contact the cylinder wall right. So you could be losing compression. Another thing, after you install all the Rings, with the markings up, stagger the Ring end gaps about 1/3 or 1/2 apart so the gaps are not in line with each other. If you have a 3 piece Oil Ring stagger them this way. 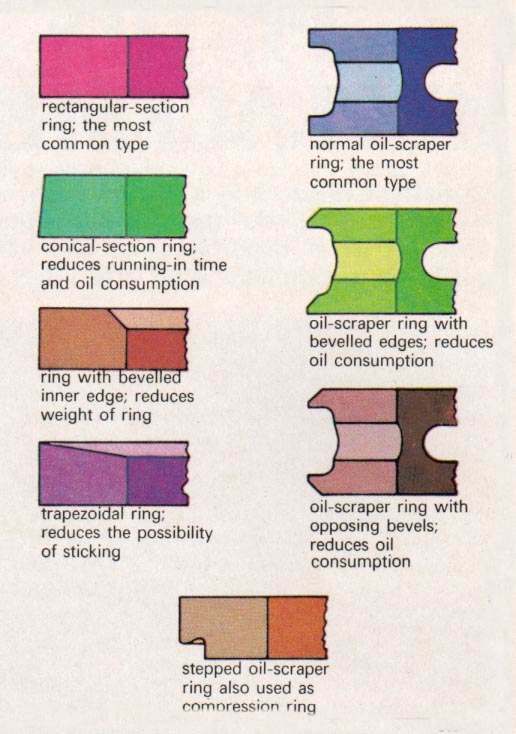 On four strokes, you can have a one piece oil Ring or a three piece oil ring. the three piece ones seem to work better but are harder to get in the cylinder. Before you install the Piston, oil the Piston and cylinder up real good. Move the Rings around in their grooves and make sure there is plenty of oil on all the parts. Now you are ready to install the Piston. Pistons do have a front and a back. If there is a mark or arrow on the Piston it always goes to the front or exhaust side. On 4/strokes there may just be an "IN" in one of the valve pockets. This goes to the intake side. (Duh!) On most cylinders I like to use a Ring Compressor. There are lots of different types of ring compressors. You can even use a regular hose clamp. The piston and rings should go on smoothly with just a little tap with a piece of wood. They say you should be able to push the piston and rings on with your thumbs... but I never can. Bad thumbs I guess. So I use a bit of wood or a lead hammer and very gently tap it in. Do not force it. If it just will not go, reposition the ring compressor. With 3 piece oil rings you just about have to use a ring compressor. If the cylinder is a big port 2/stroke you may have to reach in through the intake port, with a long thin screw driver, and push the Ring so it does not get caught in the port. Also remember, on a 2/stroke, to position the Ring ends to the peg in each ring groove. 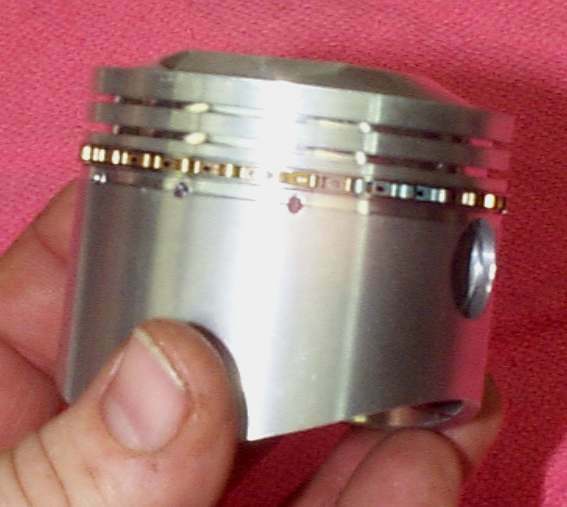 I like to put the piston with rings and one circlip installed, in from the top of the cylinder and push it down till the wrist pin hole is uncovered. Then I slide the cyl down to the rod (and bearing on a 2/stroke) and then push in the wrist pin. Install the circlip and push the cyl the rest of the way down. Don't forget the base gasket and sometimes a base o-ring. Before I install the circlip I like to put a rag in any hole the circlip could go down if it gets away from me during instillation. 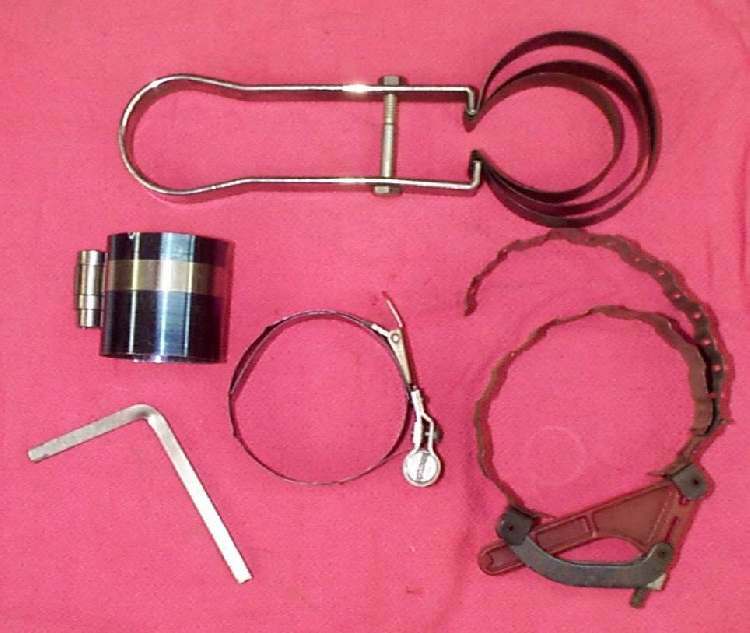 I always use new wrist pins, wristpin bearings, and circlips, although I can live with reusing a circlip. Replace with new, everything else. Circlips come in a number of different flavors, but about 95% of the motorcycle pistons out there are of the wire type. 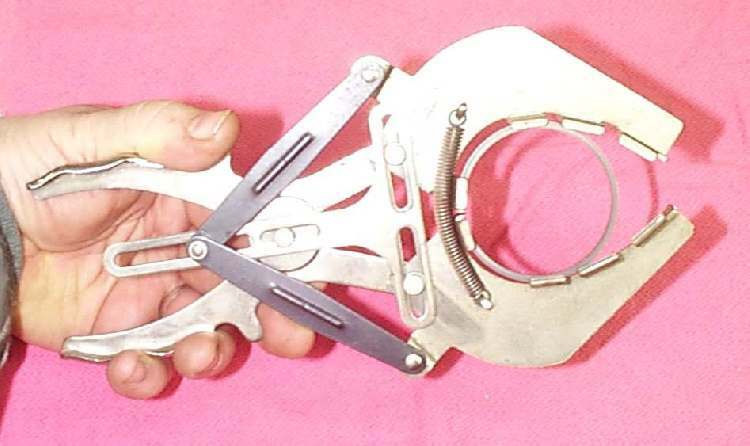 Older Harley Davidsons used their own funny circlip that required a special tool to install. 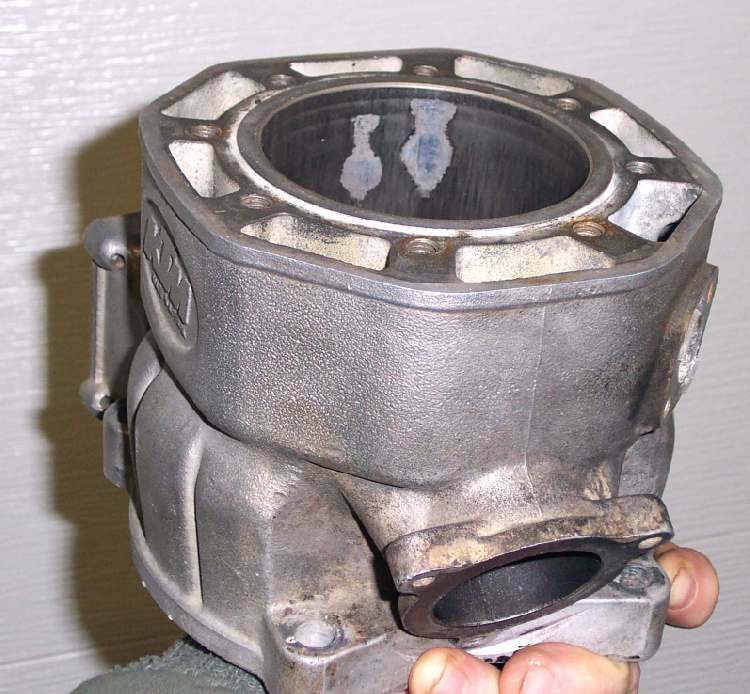 Newer HD models and aftermarket HD pistons are sort of coming around to the wire type. If you are not sure of the type, check with the manufacturer. 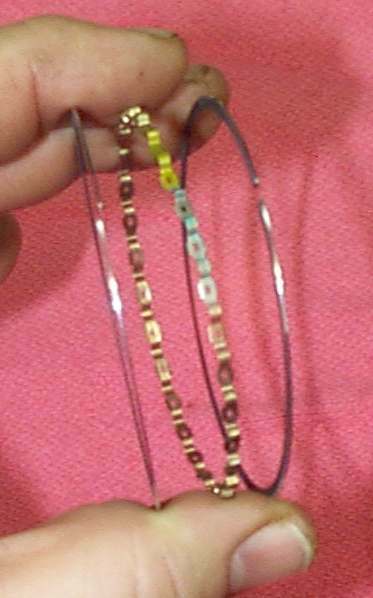 Circlips are NOT interchangeable between types. DO NOT just pick anything and jam it in there. Use the type the manufacturer of the piston recommends. If the circlip fails and allows the wrist pin to hit the cylinder walls, bad things will happen. 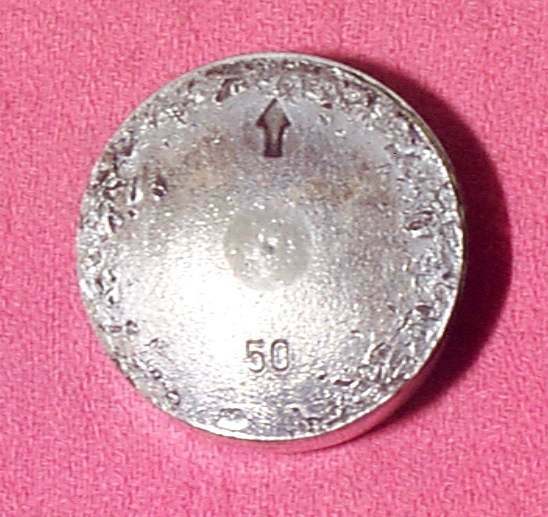 Back in the 60s and 70s some of the high performance builders used Teflon or aluminum "Buttons" in place of circlips, but that has fallen out of favor and no one seems to use them anymore. Two, three and four cylinder engines usually have the crank pins staggered so you can put the pistons in one or two at a time... makes for lots of fun. Go slow and they will go in. 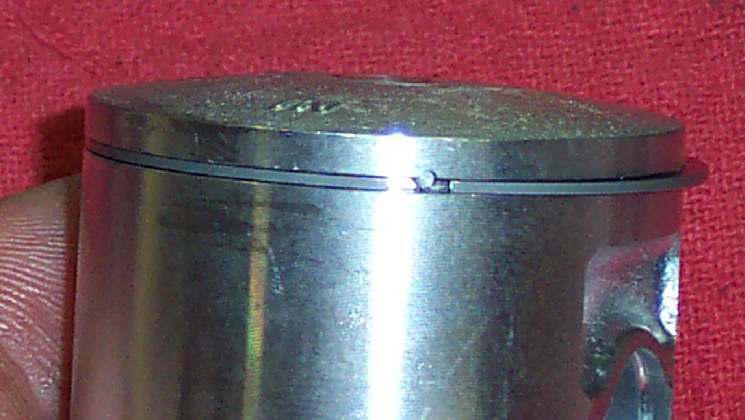 Piston oversizes are usually marked on the piston. Trouble is, sometimes the markings are printed on with ink and not stamped in or they are worn off. 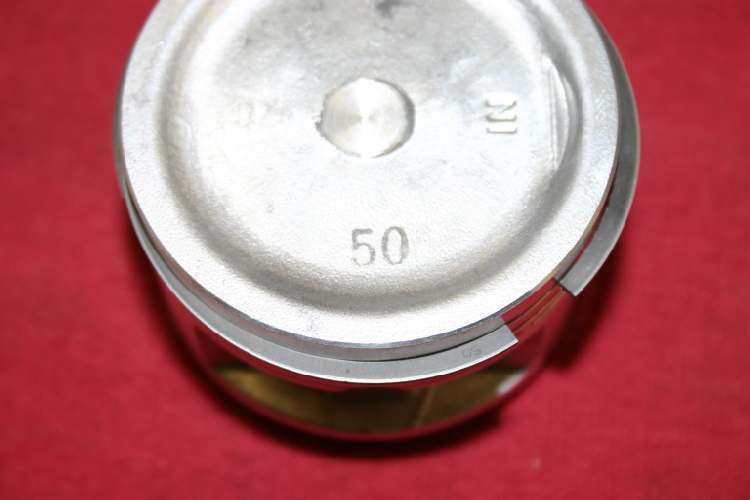 If the oversize is marked on the piston, it can be in thousands of an inch, like this .020" oversize piston or in quarters of a millimeter, like this 0.50 mm oversize piston. 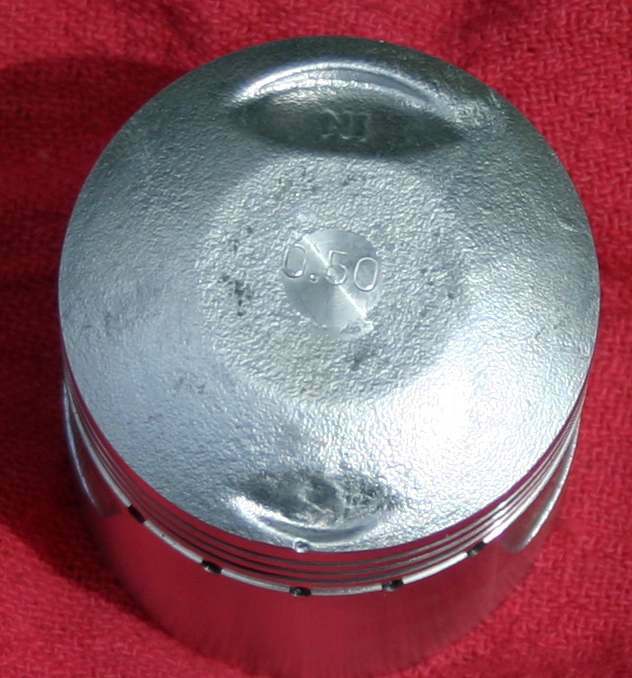 Then, just to make it interesting, there can also be a code stamped in the piston top. 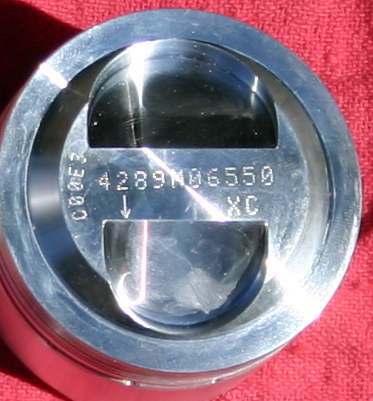 This code number tells what oversize the piston is and what type of rings are used. I always measure the old piston so I can order the right oversize. It seems all the rage now to have sleeveless plated cylinders. Sometimes, it's called Chrome Plating, Nikasil, Electrofusion, Boron Composite, SCEM Composite, Ceramic Composite, or who knows what. These cylinders are bored to the right size and then plated. 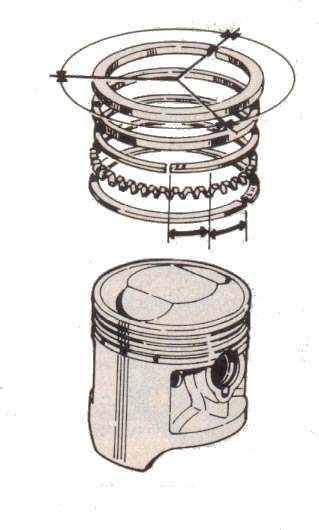 The pistons use a softer metal than the plating for the rings. The idea being the rings will wear and the cylinder will not. It's been my observation that this is not always true. I've seen what sure looked like wear to me, in more than one plated cylinder. Granted, it's not quite as bad as a steel cylinder but... ! If a plated cylinder is damaged, you will need to bore it out big and press a new steel liner into it. Then bore the new sleeve to the right size for a new piston. If the damage is not too bad, you may be able to have the damaged cylinder replated. I think this is just a high tech way of doing things on the cheap. One thing to remember. 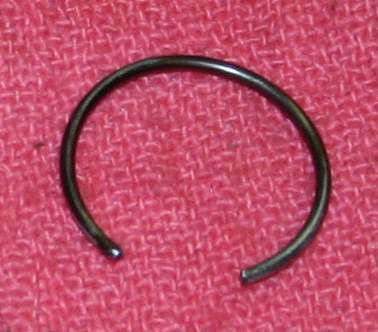 On Chrome Plated cylinders you MUST use cast iron rings and NOT chrome rings. If you use chrome rings on a Chrome Plated cylinder, things do not wear so well. It will start pealing the chrome off. You can use chrome rings on Nikasil, Electrofusion, Boron Composite and some others. Check with the ring's manufacturer to be sure. I gotta admit, plating does work good if you never seize an engine up, and we would never do that, would we? 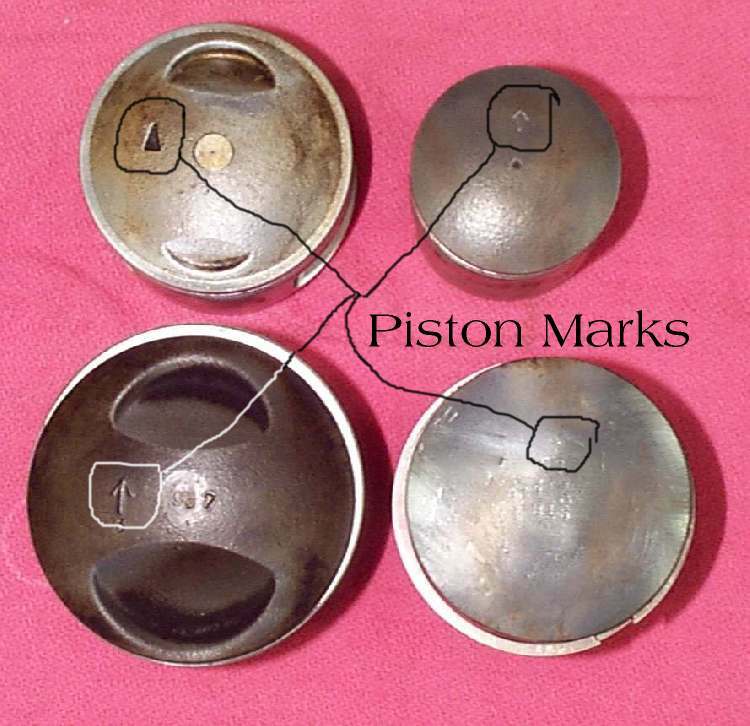 Something to remember, if you are working on an old bike and are having trouble finding a piston. As long as the wrist pin diameter is the same and you can bore the cyl to fit it. Almost any piston will work. You might have to cut the piston skirt down or drill big ports in it. 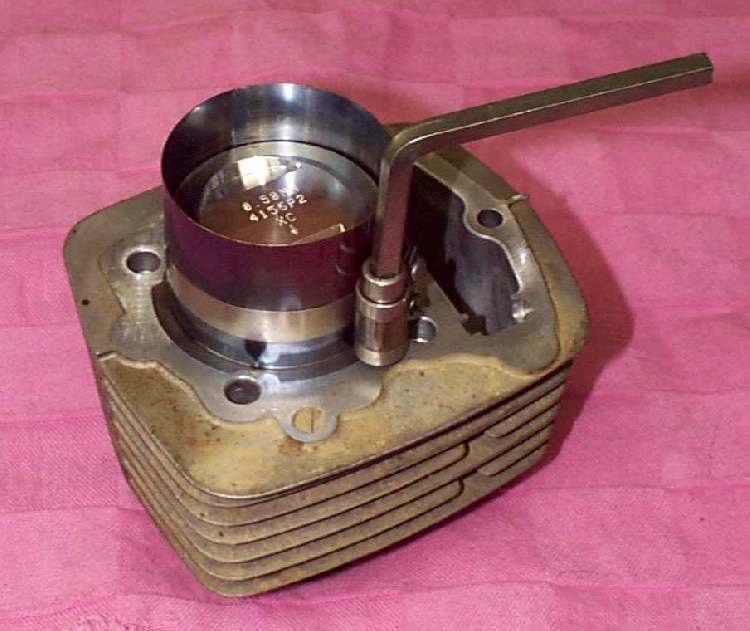 You might have to grind the piston head to fit the combustion chamber or grind inside the skirt to make it the right weight, but with some imagination you can make it fit and it will work. For example, in High School I used to take a Honda 175cc twin cylinder piston and make it work in my CT-90 engine. I would bore the cylinder out because the 175 piston (52mm) was bigger in diameter then the 90cc piston (50mm). It also had a much higher piston crown. I would put the valves in the cylinder head and then lay a piece of carbon paper on it with the carbon toward the piston. I then pressed the top of the piston into the combustion chamber and wiggled it about. The spots on the piston from the carbon paper are the high spots. I then took a hand file and filed off the carbon marks, moved the carbon paper around, rub the piston again, and file some more. I would mark and file until no marks showed up. I would then file just a bit more. I then assembled the engine with a small piece of clay on the piston. Turn the engine over and then measure the thickness of the clay. That told me how much clearance there was between the piston and the cylinder head. You need about .040" of an inch clearance. My 90 was stroked so I had to cut down the piston skirt too. The wrist pin was the same diameter as the 90 so I was in. Why did I do all this when CT-90 pistons are easy to get? Well, it gave me a measured 13.8 to 1 compression ratio. As long as I could get high octaine gas I could fly! The point is, if you can't find the right piston, lots of times, you can make another one fit. You will find that some pistons look kind of weird. This is because engine designers are always trying to get a bit more horsepower out of the engine. Check these pistons out. 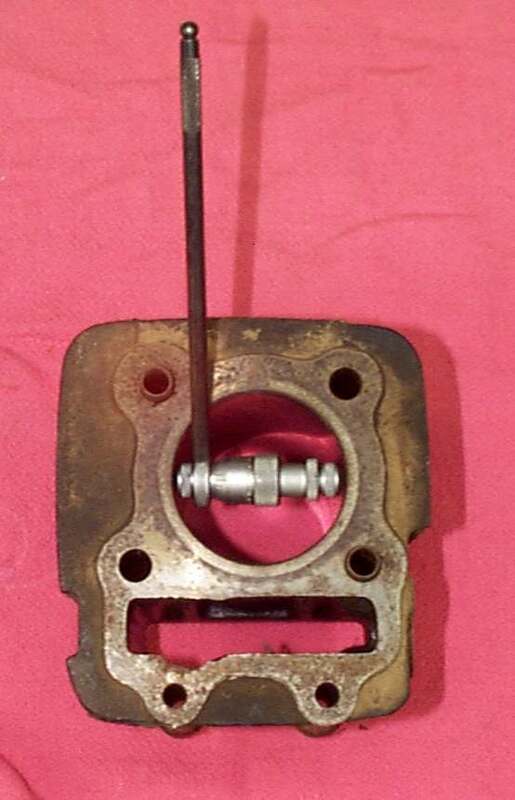 KTM 500cc Piston. Notice the posts for the wrist pin. 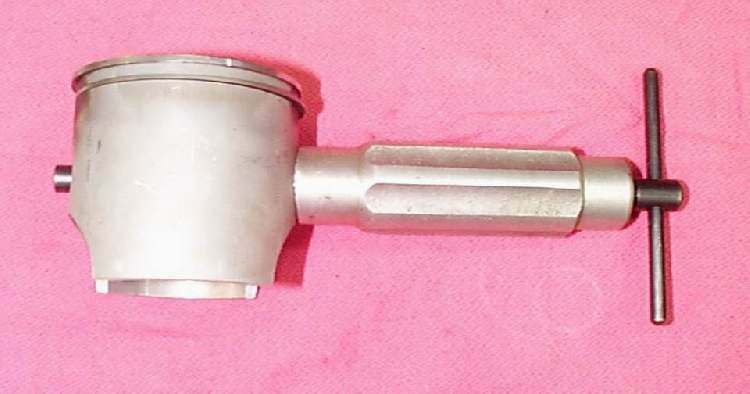 Wiseco Yamaha YZ 125cc piston. Notice the deep hole in the side. This gives a bit more fuel mixture. 650 Triumph twin, 9:1 Piston. 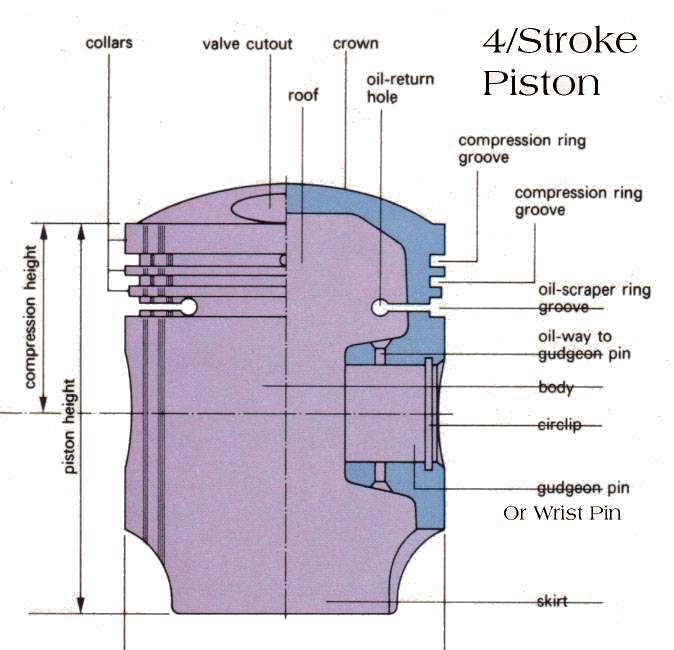 Small bore (71mm) and long stroke(82mm) make a tall piston crown necessary to produce high compression. Honda XR250R single, 9.6:1 Piston. Notice the low piston crown, short skirt and lighting holes. Wow, I guess there is a bit more to pistons then I first thought.